Bakary Kanoute, 51, is married to two wives. He has seven children (three boys and four girls). “I own 47 sheep, 3 cows and 4 donkeys. I have three workers in my manure ‘factory’. My family has more than enough to eat and we sleep on better beds. As a teenager, my family pulled resources and send me to France. I arrived France with no knowledge or skill. We knew that once you get to Europe, life will be better and make money. As years went by, I realized that it was not the euphoria thought. I was offering unskilled labor to make a living. Over time, the challenges become unbearable, host community hostile and it was difficult to find a job. 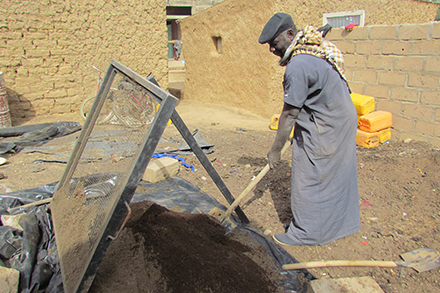 Once Kanoute got trained in improved husbandry and compost manure among others, he quickly combined knowledge gained with his talent developed and improved dramatically. In barely two years, had he transformed his family and community from producing and selling compost manure. “The entire community is cleaner and I am making a living from transforming the ‘trash’ to cash. I have employed three staff in the process and others are gathering dung and selling to me too, with compost, our community soils are more fertile and production has increased” He added. “Once home, I started from nothing and there were days that my parents will support me and I will also beg to feed my family. We eat the most basic quality of food twice a day, though we had 04 sheep, we could only slaughter one during Moslem feast. We were in corn, okro and vegetable cultivation from which we generated 400,000FCFA (800USD) which was below the minimum wage of 720,000FCFA (1,440USD) in the country. With increased income, we started eating whatever we want when we want. We have moved from begging food to buying in bulk”. “We cultivate vegetables, corn, okro and rice on a 2ha farm plot. In 2014, our harvest increased from 1 to 6tons of vegetable, okro from 300 to 400kg, corn from ½ ton to 2tons a year and rice from zero to 500kg. 2014 was my ‘big’ year as I generated 1,236,250 FCFA (2,472.5 USD) from the sale of farm produce. In that same 2014, I started supplying compost manure to other farmers in the USAID Yaajeende project and supplied 23 tons of manure worth 920,000FCFA (1,840 USD). In 2014, I generated 2,156,250 FCFA (4312.5USD) indicating 199.5% increase from national minimum wage.” He beamed. “Since vegetable production cannot go without manure, I stared gathering cow dung in my community to feed my farm. Since most of the community was not in to vegetable farming, most of their dung was not used. When I got trained and start supplying manure to other farmers via USAID Yaajeende project, I needed more dung so I started motivating young boys to gather dung for me. Before long, we had gathered all the dung in the community and needed more. When I supplied 23tons of manure to the project and they needed more, I recruited three boys in my community. In addition, 22 boys are going to nearby villages and bring dung which I buy at 250 FCFA (0.6 USD) per 50kg. Between 2014 and January 2015, I have produce and sold 68tons of compost manure at $5,440. I pay the three workers $60 each per month. I have repaid the loan of $2400 I took to reinforce the manure business. With increased income from the sale of manure, I decided to fallow my farm field for a year (2015)” He added. “Our Community is cleaner today thanks to Kanoute” Cheikhna Camara, community mayor explained. “Given that we are a cattle rearing community, our community use to have more than its quantity of dung. This attracted flies in the wet season. I may not tell for sure what the health threats were but it was not pleasant. Kanoute has restored cleanliness in the community. It would have cost most more than $500 annually to clean up but he has done it for free and others are participating without knowing”. Kanoute, in keeping with Heifer’s Cornerstones, shares at least a ton of manure to the very poor women in her community during the planting season. “In 2014, I shared improved manure to 15 women in my community for them to use in their farms. Then, about 22 boys that supply dung to us are using the money to help their families. Even as I am the sole producer of fresh vegetable in my community I give some for free to very poor homes. In 2014 I provided vegetable to 20 homes who could not afford to buy. I have passed on the training to 6 other community members”. The family plans to build a bigger and more permanent family house, purchase a big water pump for their garden and send their last 4 children to the best schools in their community.